Crop Circles : A Field Report - Kekoskee / Mayville, Wisconsin Crop Circle. 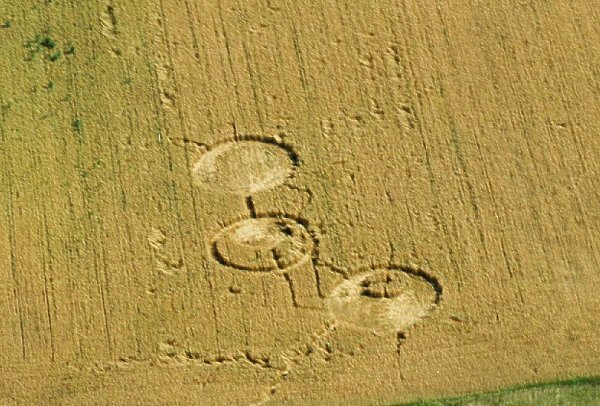 A Crop Circle, an eyewitness, photos, recorded anomalies and a meeting with a member of 'The USAF Special Crop Circle Investigative Unit'! 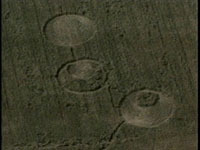 On July 23-24, 2003, a private scientific research team documented physical evidence that confirmed Art Rantalas eyewitness observation that the Mayville/Kekoskee, Wisconsin crop circle formation was not made by hoaxers. The team consisted of Gary Kahlimer of Horicon, Wisconsin, Dr. Charles Lietzau and Jeffrey Wilson of Michigan, and Roger Sugden of Indiana. Arriving at the field on July 23, 2002, we discovered and photographed the presence of several anomalies that cannot be duplicated by hoaxers.